Logging into the Managed Reporting environment and accessing HTML Composer. Creating an HTML page with a report or graph object. Creating an input control that contains a static or dynamic list of Report Library values. The following input controls provide additional options to display the content list from Report Library: Drop Down List, List Box, Check Box, Radio Button, and Tree Control. Inserting a hyperlink, image, button, or frame and setting the properties to activate the Report Library retrieval for the input control. Running the HTML page to view the Report Library values from the input control. Additionally, you may retrieve a report from the Report Library that contains a Table of Contents and On Demand Paging by inserting an additional input control for the Table of Contents on the HTML page. The Report Library includes secure access to library content and the ability to save multiple versions of the same output. When integrating Report Library in HTML Composer, you may create a static list of values from Report Library (including all versions of that report that are currently in the library). Create a new HTML file, from a folder in the WebFOCUS Repository, of your Managed Reporting environment. From HTML Composer, select New Report, or New Graph, from the Insert menu. Drag the crosshair to create a report or graph object and adjust it to the size you want. A report or graph object is created in the layout and assigned the name report(n), or graph(n), where n is a number. Create an input control to supply the Report Library content. For example, insert a Drop Down List, List Box, Check Box, Radio Button, or Tree Control from the Controls submenu of the Insert menu and create the input control, adjusting it to the size you want. Note: Only the input controls mentioned above provide options to display the content list from Report Library. The input control object is created in the layout and assigned the name object(n), where n is a number. For example, combobox(n), listbox(n), checkbox(n), radio(n), treecontrol(n). The Properties and settings dialog box appears for the control. Select Static as the Data type. Static is selected by default. Create the Report Library values for the control. You may create a static list of values from Report Library (including all versions of that report that are currently in the library). Select Use values from Library from the Static values drop-down list. 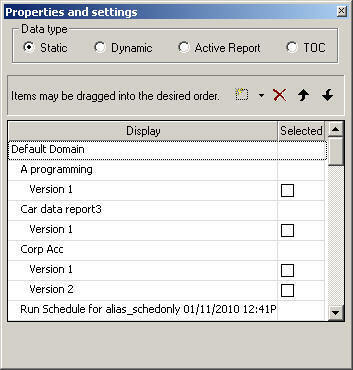 The Report Library content is retrieved in the Display column of the Properties and settings dialog box, as shown in the following image. Select Use values from Library (include versions) from the Static values drop-down list. Optionally, you may select values and click the Delete button to eliminate any values, and use the up and down arrows to rearrange the order of the values. Optionally, use the Selected column to check the box for the value you want to be selected by default. More than one value can be selected. Running the HTML page shows the input control with the Report Library static list, as shown in the following image. Click the Design tab in HTML Composer and insert a hyperlink. The hyperlink obtains the report/graph when selecting a Report Library value from the input control. This step requires that you create hyperlink properties. You can create hyperlink properties by inserting an image, hyperlink, button, or frame. Select Library from the Action drop-down list. Library only appears if a static or dynamic list of values was created for Report Library on the Parameters tab. Select the Source drop-down list to select the input control as the source of your Report Library content. The selected input control will be populated by the Report Library data. 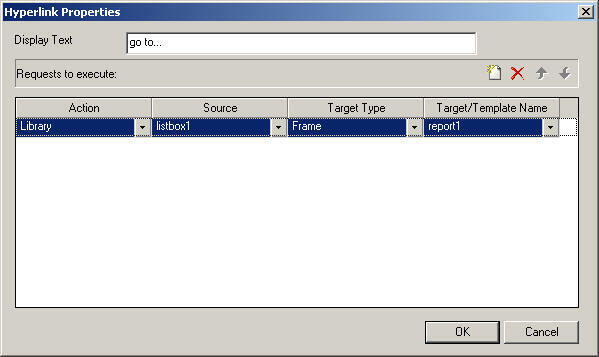 Select the Target Type as Frame, Window, or InfoWindow for the hyperlink output. Frame is the default selection. The Target Type option does not appear on the Hyperlink Properties dialog box if you are inserting a frame as the hyperlink. Frame is the default target for a frame object. Select the Target/Template drop-down list to select the report object for the Report Library results. The Target/Template option does not appear on the Hyperlink Properties dialog box if inserting a frame as the hyperlink. Clicking the input control automatically populates the report at run time. 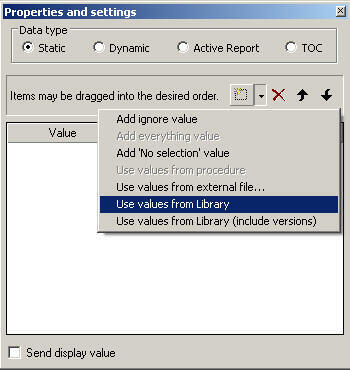 The following image shows the Hyperlink Properties dialog for a button that retrieves content from the Library and displays that content in the report1 object when clicking a value from the drop-down list. Save and run the HTML page. 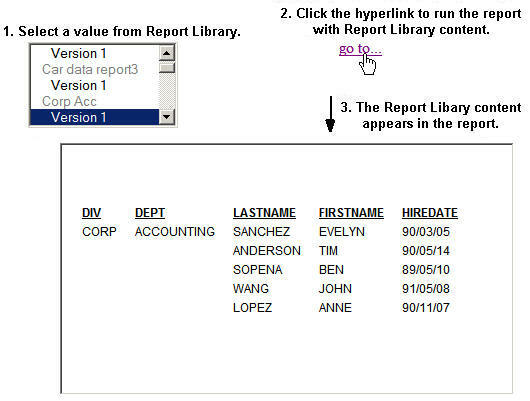 Select a value from the Report Library and click the hyperlink to run the report. The following example shows a drop down list input control with a static list from Report Library. Clicking the hyperlink button runs the report with the selected Report Library content. Creating a dynamic list of values uses the default Custom library JSP from WebFOCUS to load the Report Library content. From HTML Composer, select New Report or New Graph from the Insert menu. Select Dynamic as the Data type. The dynamic value options appear. Select Other to create the Report Library values for the control. The following image shows the dynamic library options on the Properties and settings dialog box. Library appears indicating that HTML Composer will gather data from the Report Library. 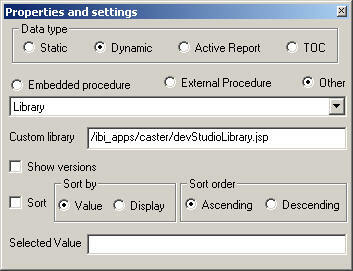 The Custom library field specifies the JSP to call to get the Report Library content. The default is the JSP delivered with WebFOCUS. If the Custom library location is changed from the default for one control, other controls will not inherit that change. Optionally, select Show versions to have the Report Library content show multiple versions of the reports, if multiple versions exist. This option is off by default, indicating that only the last version of the report in Report Library will be retrieved. Optionally, click the Sort option to enable and select the sort order options for displaying values in dynamic list control. When Sort is enabled, you may select the Sort by and Sort order options for the control. Optionally, enter the exact value in the Selected Value input field, as it appears in the Report Library, if a value should be selected by default. Close the Properties and settings dialog box to create the control with dynamic values. 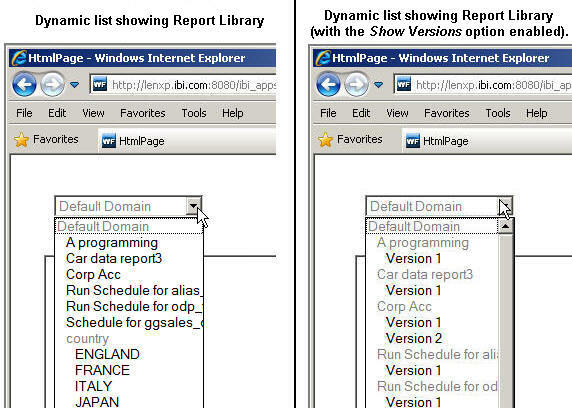 Running the HTML page shows the input control with the Report Library dynamic list, as shown in the following example. The Target/Template option does not appear on the Hyperlink Properties dialog box if you are inserting a frame as the hyperlink. Clicking the input control automatically populates the report at run time. 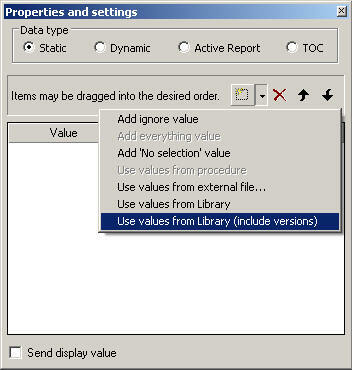 The following image shows the Hyperlink Properties dialog box for a hyperlink that retrieves content from the Library and displays that content in the report1 object when clicking a value from the list box. 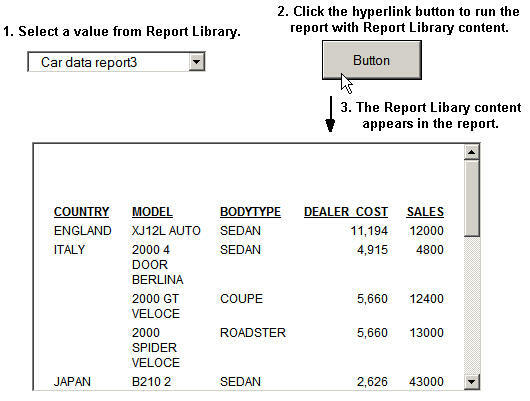 Select a value from the Report Library and click the hyperlink to run the report. The following example shows a list box input control with a dynamic list from Report Library (showing versions). Clicking the hyperlink runs the report with the selected Report Library content. 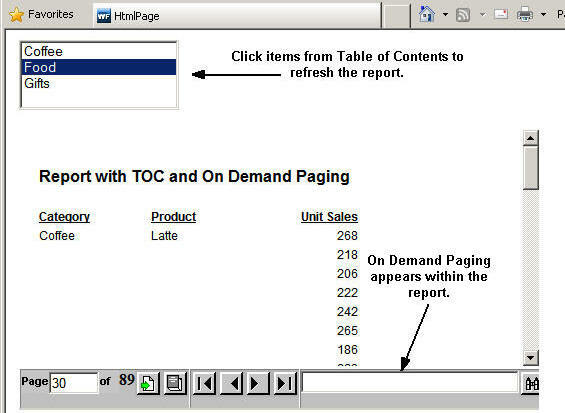 When creating a report in Report Painter with the HTML output format, the Table of Contents options are enabled for a report when using the On Demand Paging feature. The combination of using the Table of Contents with On Demand Paging displays at run time when the report is used in HTML Composer. Running a report with a Table of Contents and On Demand Paging outside of HTML Composer shows only On Demand Paging. Integrating a report with a Table of Contents and On Demand Paging in HTML Composer requires that you create an input control as a placeholder for the Table of Contents at run time. Selecting the TOC option for the input control on the Properties and settings dialog box enables the Table of Contents to appear on the HTML page. This permits both the Table of Contents and On Demand Paging features to display at run time. When these specific reports are retrieved, the Table of Contents is extracted from the report and displayed separately (from the report) on the HTML Composer page, but still maintains its ability to interact with the report. When importing or referencing a report using On Demand Paging, the full navigational toolbar may not be viewable in the report output. You must resize the report frame in the HTML Composer Design View to display the full On Demand Paging navigational bar and view the toolbar correctly at run time. Integrating a report with a Table of Contents and On Demand Paging in HTML Composer is limited to the following input controls: Drop Down List, List Box, Check Box, Radio Button, and Tree Control. This procedure describes how to create an additional input control for retrieving the Table of Contents, if you are using a report with a Table of Contents and On Demand Paging in HTML Composer. The TOC option also appears when accessing HTML Composer from the Data Servers and Projects on localhost areas of Developer Studio. 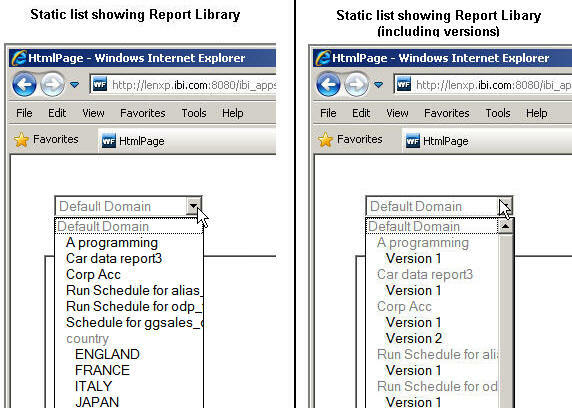 From HTML Composer, select New Report from the Insert menu. Drag the crosshair to create a report object and adjust it to the size you want. A report object is created in the layout and assigned the name report(n), where n is a number. This object may be populated with a report from Report Library, or a procedure (containing a Table of Contents and On Demand Paging) can be opened, imported, or referenced. 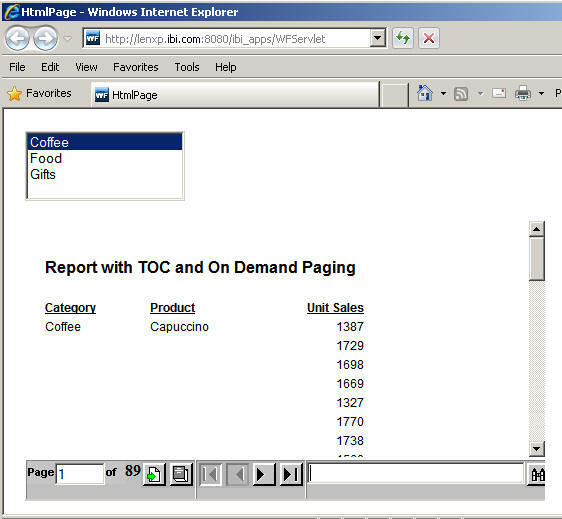 Create an input control as a placeholder for the Table of Contents from the report. For example, insert a List Box from the Controls submenu of the Insert menu and adjust it to the size you want. The input control object is created in the layout. Tip: If you are creating an input control for static or dynamic list values from a Report Library, the Table of Contents input control should be a separate, additional control on the HTML page. Select TOC as the Data type. The available TOC objects appear in the drop-down list. Select the report name from the Available TOC objects drop-down list. This option must be enabled for a report that contains a Table of Contents, as it ensures the HTML page displays both the Table of Contents and On Demand Paging features at run time. Close the Properties and settings dialog box and run the HTML page. The Table of Contents and On Demand Paging appear at run time, as shown in the following image. The Table of Contents from the report appears in the list box placeholder, and the On Demand Paging feature appears within the report. The Table of Contents is extracted from the report and displayed separately in the input control on the HTML Composer page, but still maintains its ability to interact with the report. The On Demand Paging options are available from the report frame on the HTML page.